A major defence manufacturer has become the latest beneficiary of the huge time and money savings delivered by 3D-printing technology. Moog Aircraft Group was keen to examine how it produced bespoke co-ordinate measuring machine (CMM) fixtures for each of its machined parts – a process that has traditionally been outsourced to external suppliers, who made them from tool steel. It identified 3D printing as the best solution and turned to the experts at SYS Systems, part of the Foston-based Carfulan Group and the platinum partner and supplier of world-leading Stratasys products in the UK. 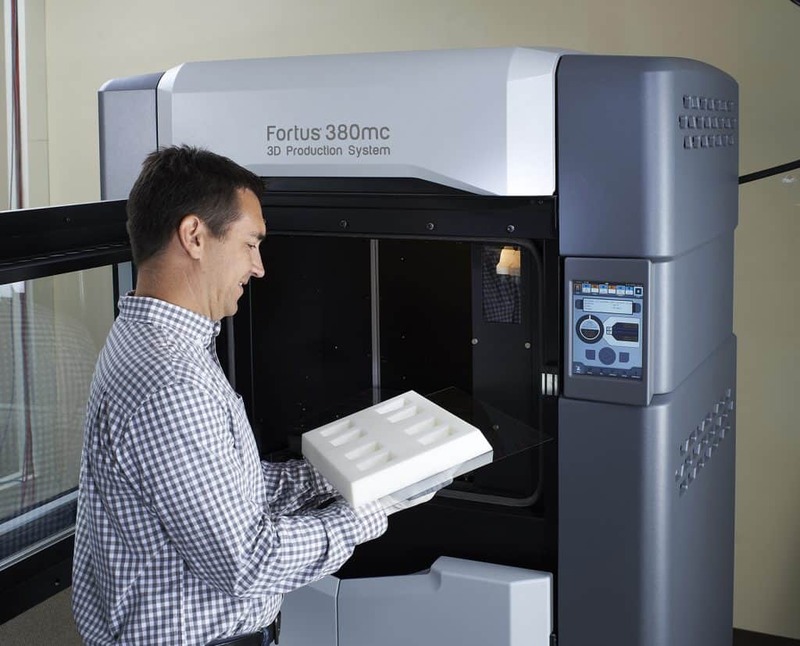 The Fortus 380 was selected for the job, a system that uses fused deposition modelling (FDM) technology to create parts quickly using high-quality, production-grade thermoplastics. The machine has helped to cut lead times for CMM fixtures at Moog from more than a month to just hours, eliminated production bottlenecks and reduced costs tenfold. James Stuart-Young, Manufacturing Engineering Manager (Military Value stream) at the Wolverhampton-based company, said: “The outsourcing process always had a lead time of four to six weeks from drawing release to receipt of a finished fixture. Rob Thompson, Sales Manager at SYS Systems, said: “Engineers from Moog attended an open house at our facility near Derby. As a result of the meeting we offered to print an aircraft valve body, a 30-hour print, simply to show the capabilities of Stratasys Fortus FDM machines. FDM sparked the 3D printing revolution more than 20 years ago, with Stratasys leading the way in developing systems that appeal to large manufacturers, designers, engineers, educators and other professionals. FDM proves extremely cost-effective when producing hollow and/or honeycomb features, which are commonplace in fixture applications such as the ones required by Moog. SYS also called upon its extensive in-house expertise to deliver advanced training to the team at Wolverhampton so that the firm could maximise the benefits of the Fortus 380. Mr Stuart-Young said: “The ability to produce in-house has put us back in control of prioritising production to suit the demands of the customer programme. “Build times vary due to the range of parts we are printing, but for the CMM fixtures it is approximately 20 hours. Fixtures that have cost us in excess of £2,000 in the past can now be made for a couple of hundred pounds.